THE WORLD'S LEADING CARMAKERS AGREE. 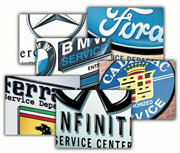 Developed over decades of experience in the rainy Pacific Northwest, the methods used at Johns are consistent with those prescribed in the Owner's Manuals of most leading auto manufacturers, including General Motors, Ferrari, BMW, Infiniti, Mercedes Benz, Chrysler, Ford, Porsche and others. Why do builders of the world's costliest and most popular automobiles recommend our way of washing? Because experience has shown it to be superior to all others.